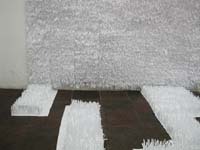 Kerstin Stoll/Emanuel Geisser use white grass-like pads made from standard 4A paper in their work clean green. The pads work like modules. 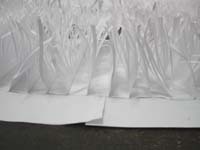 They are assembled to two large continuous "carpets" of paper grass hung on the opposite side walls of the small exhibition space. On the dark brown floor, the modules aggregate to irregularly shaped islands that visitors have to negotiate carefully. The work reminded me of the sculpture "They feel secure, they know his name" by Pierre Weiss at Charim/Klockner in Vienna (Jan-Mar 2000) documented in Kunstforum 152, Oct-Dec 2000, pp241. Weiss had covered the entire gallery space, including walls, with an irregular grid of wooden ledges that forced the visitor to navigate the space carefully. 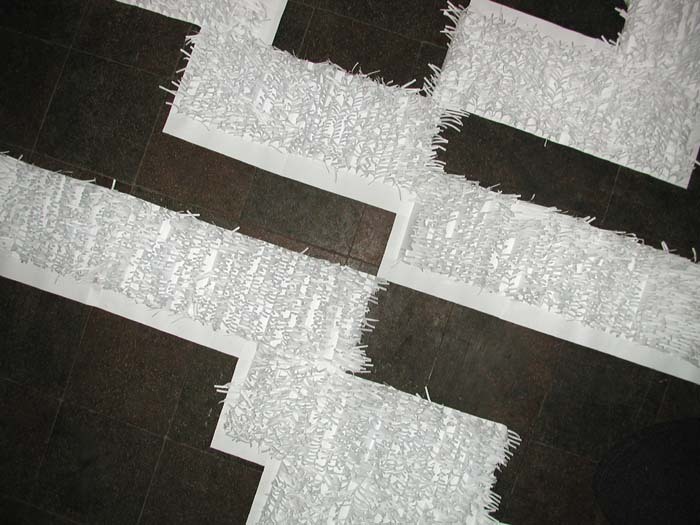 In the piece of Stoll/Geisser, the question is implied whether the paper grass may be trod on - given the very limited space of the Ausstellungsraum Taubenstrasse 3, this inevitably happened during the opening. Stoll and Geisser simply replaced the worn-out modules. The association of the golf course green and the modular pads of grass used in a football stadium suggests an inversion of the usual relation between the usable positive space and the gap. In a stadium, grass is the heavy-duty surface the players tread on, and gaps are filled by new modular patches. 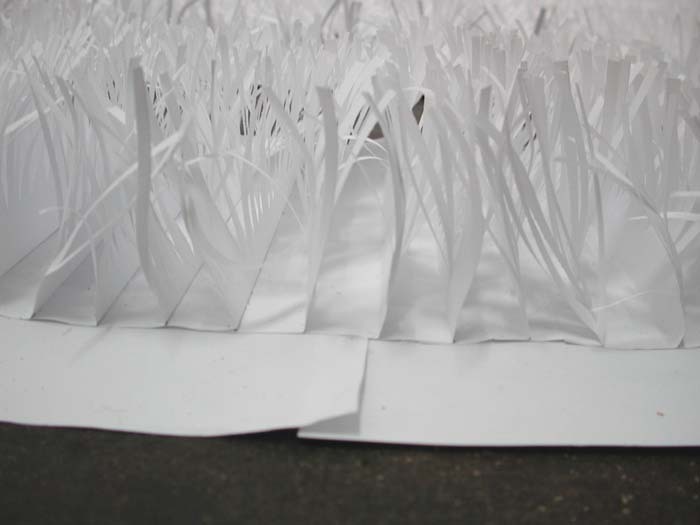 Here, it is the grass that cannot be trodden on - at least not without soiling the immaculate white pads or flattening the leafs - while the gaps of floor space become the actual islands on which visitors can navigate the space.